Reliable, local, up-to-the-minute search information including Annapolis condo fees, square footage, maps, and gorgeous photos -- easy to use and immediately updated through the Bright MLS Realtor® database. Stay informed. Save your searches to receive scheduled email alerts of new listings, price changes, sold data, and market reports. 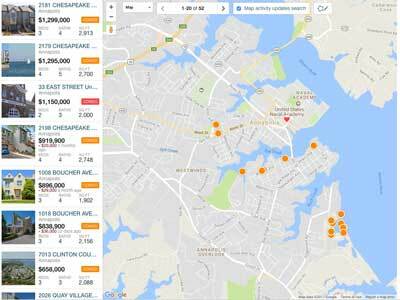 Our Interactive Map Search > allows you to view Annapolis Condo properties on a detailed Google map and refine your search by drawing boundaries around the locations you prefer. Curious about what’s happening now in a specific community or neighborhood? You can create a Custom Market Report > to see what’s active, under contract, and recently sold. Contact Bill Hyland at 410-570-9111 or bill@annapoliscondos.com today to find out how we can be of assistance. We know the market well, we'd enjoy working with you to find the perfect Annapolis Condo! Grandview @ Annapolis Towne Ct Bldg.